WASHINGTON (Reuters) - The Cuban flag was raised over Havana’s embassy in Washington on Monday for the first time in 54 years as the United States and Cuba formally restored relations, opening a new chapter of engagement between the former Cold War foes. Underscoring differences that remain between the United States and Communist-ruled Cuba, Rodriguez seized the opportunity to urge Obama to use executive powers to do more to dismantle the economic embargo, the main stumbling block to full normalization of ties. For its part, the Obama administration pressed Havana for improvement on human rights. But even with continuing friction, the reopening of embassies in each other's capitals provided the most concrete symbols yet of what has been achieved after more than two years of negotiations between governments that had long shunned each other. In a further sign of a desire to move past a half-century of enmity, Secretary of State John Kerry later hosted Rodriguez, the first Cuban foreign minister to visit Washington since the Cuban Revolution, for talks at the State Department. While both men stressed the momentous occasion, they also sought to temper optimism fueled by the day's festivities. "The historic events we are living today will only make sense with the removal of the economic, commercial and financial blockade, which causes so much deprivation and damage to our people, the return of occupied territory in Guantanamo, and respect for the sovereignty of Cuba," Rodriguez said at the reopening ceremony. Obama has modestly eased some business and travel restrictions but the broader 53-year-old embargo remains in place. Only Congress can lift it, something majority Republicans are unlikely to do anytime soon despite the Democratic president's appeal for it to be rescinded. With Rodriguez at his side later on Monday, Kerry hailed a "new beginning" in relations but said there was still much that divided the two governments and that the path to complete normalization may be "long and complex." White House spokesman Josh Earnest told reporters the administration was "hopeful" that Cuba in coming years would start to show respect for basic human rights. Earlier, a three-man military honor guard marched onto the front lawn of the newly restored embassy in Washington where the Cuban flag was hoisted while the Cuban national anthem played. There were competing chants from the crowd outside the gates. "Cuba si, embargo no!" shouted one group. "Cuba si, Fidel no," yelled a much smaller contingent of counter-demonstrators. Rodriguez then spoke inside the stately building, which was visited by revolutionary leader Fidel Castro just months after he seized power in Cuba in 1959. 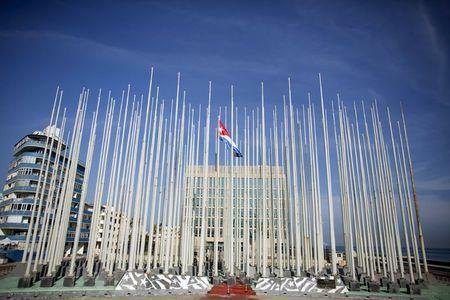 In Havana, the U.S. Embassy was also reopened for business but with much less fanfare. The Stars and Stripes will not be hoisted there until a visit by Kerry on Aug. 14. A crowd of about 100 Cubans, tourists and Cuban-Americans gathered in front, many clutching small U.S. flags. 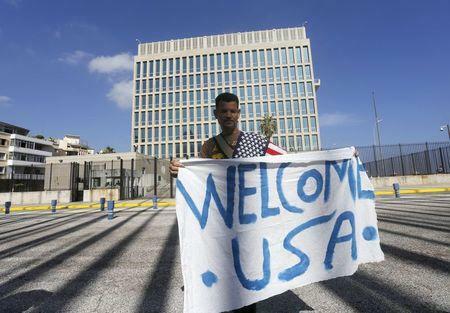 One Cuban held a banner that read, "Welcome USA." In Washington, more than 500 people attended the ceremony at the nearly century-old mansion. The U.S. delegation was headed by Assistant Secretary of State Roberta Jacobson. 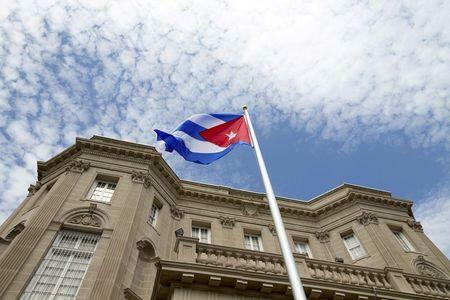 Before dawn on Monday, workers hung the Cuban flag in the lobby of the State Department alongside the banners of other countries with which the United States has diplomatic relations. "We've waited a long time for this day," Senator Patrick Leahy, a staunch supporter of rapprochement, said as he entered the grounds of the Cuban Embassy. Hard-line anti-Castro lawmakers, such as Senators Marco Rubio and Bob Menendez, who oppose Obama's outreach to Cuba, were not invited. Republican presidential candidate Jeb Bush underscored his opposition on Twitter: "Obama's rush to restore diplomatic relations with Cuba is wrong. This embassy will only serve to further legitimize repressive regime." The opening to Cuba reflects Obama's presidential doctrine of negotiating with enemies, a concept that faces an even tougher test with a nuclear deal reached with Iran last week. But the counterpoint to restoration of ties is a long list of lingering disputes, as well as Havana's desire to keep a tight rein on Cuba's society and its state-run economy. In addition to lifting the embargo, Havana demands the return of the U.S. naval base at Guantanamo Bay - an issue that Kerry said Cuba had "strong feelings about" but which is not currently under discussion. Other problems include the countries' outstanding legal claims against each other and Cuba's sheltering of American fugitives.